I cannot believe I wrote this post a year ago. When I put it on Facebook, I hadn’t thought much about it. But lo and behold Mark from my high school French class (and just about every other class I had growing up) kindly contacted me to tell me he still had the books. Not only did he still have the books, but if I wanted them, those books could be mine! And so thanks to Mark, those books are now mine! They make me so happy. 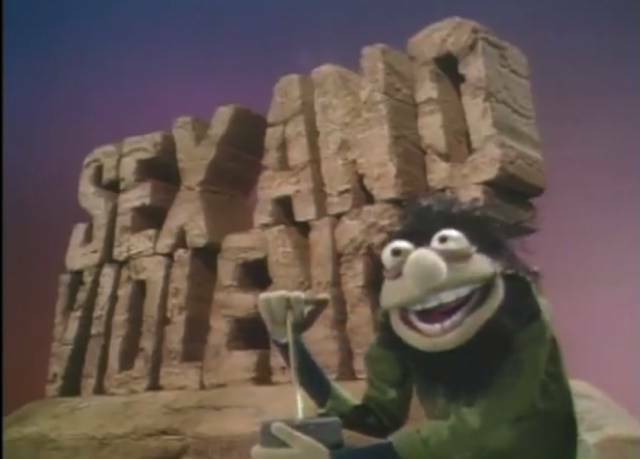 A still from a pilot episode of The Muppet Show. Some time ago, I wrote and dummied this story about a bear named Ursula (natch) who does water ballet. She’s training for the big water ballet championship with her friend Ricardo..
…until one morning, when they discover a new pool policy: NO BEARS ALLOWED! Above: An original painting for Swamp Angel written by Anne Isaacs, illustrated by Paul O. Zelinsky. Oil on wood veneer. I was first introduced to Paul O. Zelinsky’s work when I heard him speak at the 2010 SCBWI Illustrator’s Intensive. I was inspired by the way his style changes depending on and in service to the story, so I was very excited when he recently agreed to speak with Liz and me at his Brooklyn studio. These three books are on my bedside table*; they make me happy. First and foremost, they happen to be fantastic reads that I highly recommend full of humor, heart and outstanding illustrations. I look at them and rearrange them often and even though I’ve finished them, I just don’t want to put them away. I think that has something to do with the yellow. I rarely use yellow in my work, it seems like a bold choice and an even bolder one for a cover. But seeing these three side by side is a reminder that I should. I can’t get over how great they go together and most of all, how they make me feel just seeing them. I looked on my bookshelves and found only two other book covers that were yellow (both unremarkable books). Is this a trend in publishing and book design or is this just a happy circumstance? Above: My piece for Snow White and the Seven Dwarfs, an assignment for the Illustrators’ Intensive. I am still riding an inspired high from last weekend’s SCBWI Winter Conference. I’ve been to the conference four times now and the Illustrators’ Intensive Day is always the highlight for me. 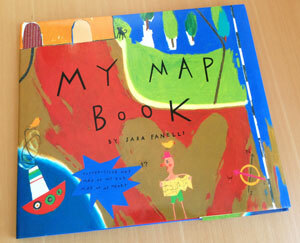 Art Director Cecilia Yung’s interview of Tomie dePaola was fantastic. They structured the talk around a comparison of Tomie’s book illustrations and his costume and set design work. Tomie and Cecilia drew insightful parallels between the stage and the picture book spread and picture books and the theater in general. As an illustrator, you are the casting director, costume designer, set designer and director. Brett Helquist offered some great insights into creating memorable and engaging characters. He also encouraged us to practice every day. “Musicians practice daily,” he said. We should practice things that won’t necessarily be published to refine our skills. 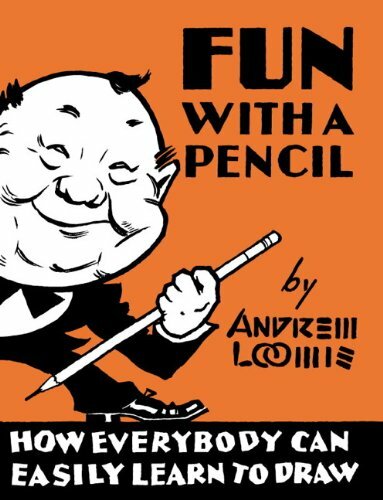 His recommended reading: Fun With a Pencil and Creative Illustration, both by Andrew Loomis, and Cartooning the Head and Figure by Jack Hamm. An interior page from Fun With a Pencil by Andrew Loomis. Above: Still from Ruthie’s stop motion animation about today’s post. Speaking of endpapers: I was at my friend Sarah’s recently, digging through her children’s books. (Sarah teaches third grade.) 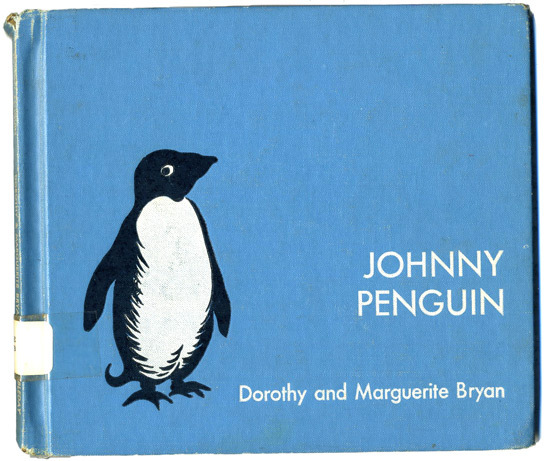 She kept handing me stuff, saying, “Oh, this one is GREAT.” Then she handed me Johnny Penguin, published by Doubleday in 1931. Ah, the good old days of pre-separated artwork (some of which appears to have been prepared in lithographic crayon, yum yum!). These endpapers, and some of the interior illustrations, are printed in black, a lovely warm gray, orange, and turquoise. All I can say is that I would like wallpaper made out of this stuff. Illustration from Miss Elephant’s Gerald, a tablet app based on a song by the Pop Ups. 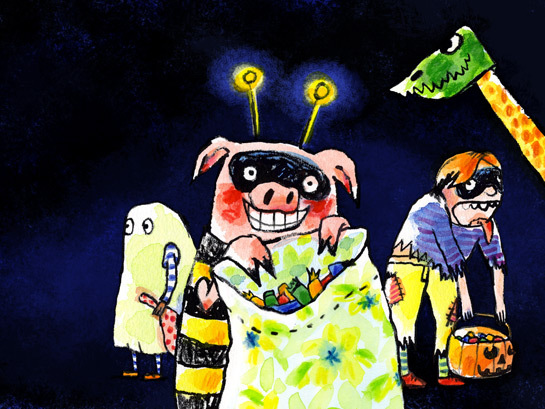 A couple of months ago, the awesome Brooklyn-based children’s band The Pop Ups contacted me, asking me if I wanted to illustrate their jazzy Halloween song Miss Elephant’s Gerald. There would be animals. Playing instruments. Wearing costumes. Oh yes, I was very interested. Art Director Tova Diamond at Real Simple asked me to create some illustrations for an article about sleep for their 2013 family issue. The article, titled “Creatures of the Night” and written by Naomi Shulman, details different child sleep behaviors and how parents can handle them. Each behavior is represented by a different animal. Fellow art director Jenn McManus recently tipped me off to We Art Boston, an awesome online auction of original children’s book art that starts today. Susan and Joe McKendry have collected over 100 original works of art from 50+ amazing children’s book illustrators and are auctioning them off online to raise money for the Emergency and Trauma Fund at Boston Children’s Hospital in memory of the Boston Marathon bombing victims. The auction runs through October 24. A beautiful message from Susan and Joe, excerpted here, sums up the amazing generosity they encountered while putting this auction together.